Did someone ask for an Android handheld that looks like an Xbox 360 controller with a 720p 5″ screen hanging off it? Well NVIDIA has you covered with Shield. 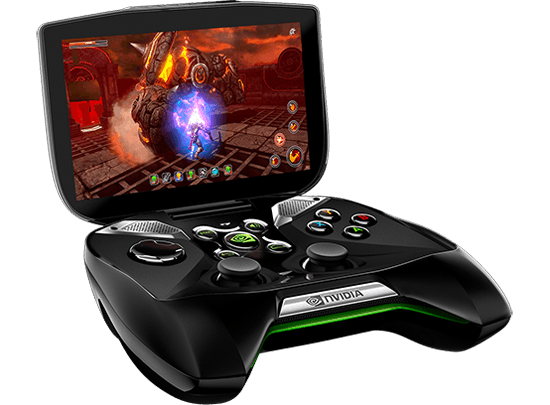 It’s an ugly looking thing but this Tegra 4 powered handheld can also stream Steam games from your PC with “minimal latency”. It can also output to a display of your choice via an HDMI cable. The big mystery for all of us is the price tag. Without any headlining game support, I cannot see this piece of hardware being very successful above the $249.99 price tag. Yes, it has access to the Google Play Store but that’s not enough to sustain the device in my opinion. I can’t even think of a single “must play” title that originates from the Google Play Store. There is an opportunity for this “Shield” to live as a high powered emulation machine. SNES, Sega Genesis, CPS2, Neo Geo, PlayStation One and whatever else has an emulator running on Android should work splendidly on this. AnandTech spent some time with the handheld. Apparently it’s surprisingly light and the Steam streaming works well. The Shield is scheduled to debut in Q2 of 2013. Everyone was expecting the next Nintendo handheld to be announced at E3 2010 in June. I don’t think anyone expected Nintendo to put out a press release (for investors) announcing their intentions. So what do we know about the Nintendo 3DS? I’ve got to admit, I am excited for this. I’d love to experience some Mario in 3D — especially without glasses! I’m sure we’ll see more at E3 2010! How is it that this old engine still manages to creep up onto frontpages? It’s nearly ten years old, but it’s still a cherished piece of benchmarking software — stressing web browsers and mobile devices. Games Radar snipped a piece of PC Gamer’s interview with John Carmack and his upcoming project, Quake Live. Not a lot of new details, though. It’s more like reassurrance. At least they provided some screenshots. That’s Quake III for sure. As an actual benchmark, NVIDIA decided to showcase their new “smaller than a dime” NVIDIA Tegra 600 GPU running Quake III as well. Check it out. That’s impressive. Imagine an iPhone 2 or any other handheld with that chip?